View More In Ornament Hooks - Page 4. Lot of 2 great cast iron coat hooks. Made just like the hooks of the past. Measure approx. 6" tall top to bottom, 4 1/4" wide, 2 1/2" from the wall to the front. This item has 2 holes for easy hanging. These do not include screws! This item was manufactured to look antique, expect some built in imperfections. 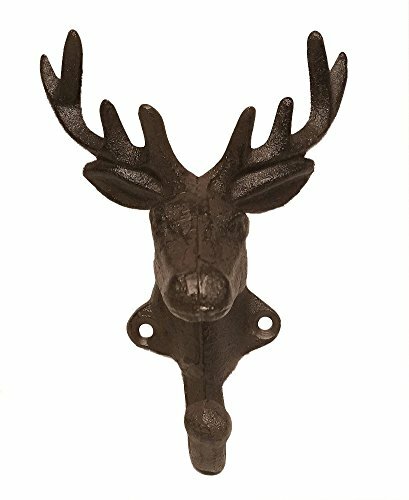 Cast Iron DEER Double Hooks - Use it to hang towels, jackets, keys and more in true style! Measure approx. 6" tall top to bottom, 4 1/4" wide, 2 1/2" from the wall to the front. This item has 2 holes for easy hanging. These do not include screws! If you have any questions about this product by Starworld, contact us by completing and submitting the form below. If you are looking for a specif part number, please include it with your message.